Calling project management a “job” is a little misleading. 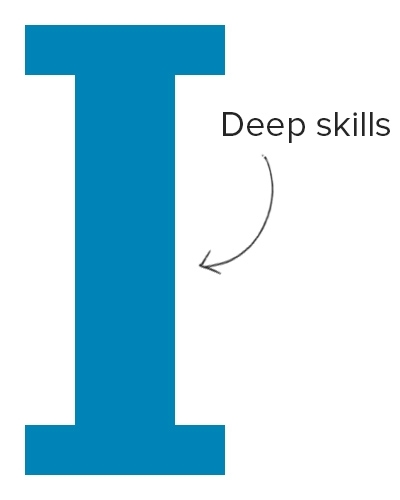 The idea of “skill shapes” stems from design consultancy IDEO’s work. 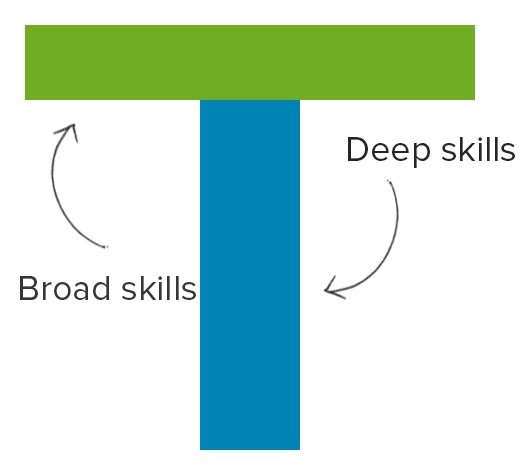 IDEO’s CEO, Tim Brown, built his company around “T-shaped” people, i.e. people with exceptional expertise in one area as well as a smattering of knowledge of related topics. But people don’t always have skills that follow this pattern. Some people have deep expertise on a single topic but know little about others. Such people have ‘I-shaped’ skills. 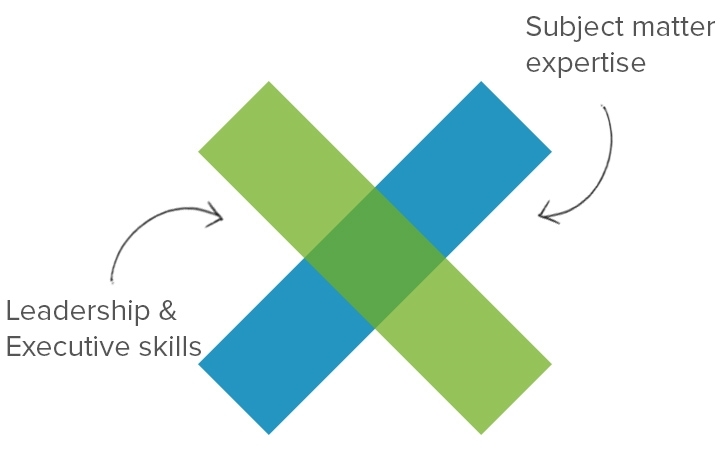 There is yet another skill-shape – ‘X-shaped’ (sometimes called ‘E-shaped’). This is typically called the “executive” skill shape (hence the name) since senior leaders often possess it. This cross-domain expertise can be hard to build. Keep this in mind as you go through the list of project management skills below. Be prepared to immerse yourself in the field you’re managing – construction, software, creative projects. And at the same time, build up your ancillary skills – communication, leadership, and strategic expertise. Complement this knowledge with core project management capabilities – breaking down projects, mapping schedules, managing teams, etc. A formal course of study, such as the PMP exam certification, will equip you with this PM-specific knowledge. Else, resources such as this blog are a good enough alternative as well. Along the way, also focus on your leadership skills. Try to see every project – and the people you’re managing – from the perspective of a senior executive. The more you can align the project with the organization’s broader objectives, the better you’ll be at keeping all stakeholders happy. What’s missing from these frameworks is leadership. Projects often go astray not because they’ve been poorly managed, but because there is no one to motivate and direct the project team. The easy availability of PM and communication tools has made this more evident than ever. As PMI writes, “leaders innovate; managers administer”. In the current hyper-competitive business landscape, it’s easy to find administrators. Innovative leaders, however, are in short supply. Your goal should be to cultivate all these qualities. While it’s important to administer projects well, you should also seek to lead projects in such a way that your team is inspired to do the right thing on its own. Project management isn’t just about inspiring people. It has a deeply functional component as well. A good project manager should be able to break down, plan, and schedule projects – all in accordance with the formal methodologies used by the organization. The ability to create all the documents associated with managing a project – work breakdown structure, Gantt chart, scope statement, etc. How formal your knowledge should be will depend on the maturity of your organization’s PM processes. In smaller, less mature organizations, you might not need formal PM knowledge. Nonetheless, you’ll need on-the-job experience to ensure that there is consistency and formal rigor in your project management processes. 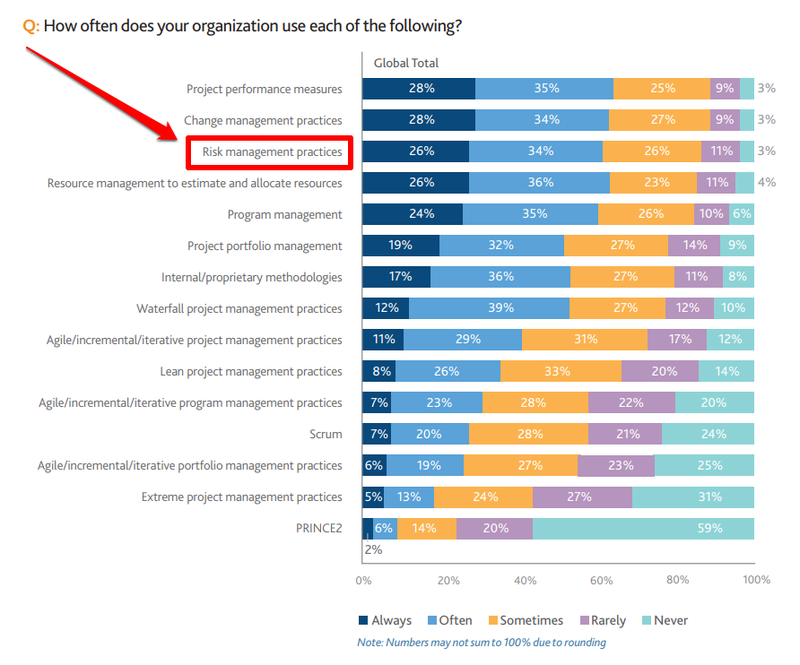 To manage projects is to manage risk. As the de-facto manager and leader in charge of the project, you’ll often be the target if things go wrong. Fortunately, modern PM tools such as Workamajig make managing risk much easier. 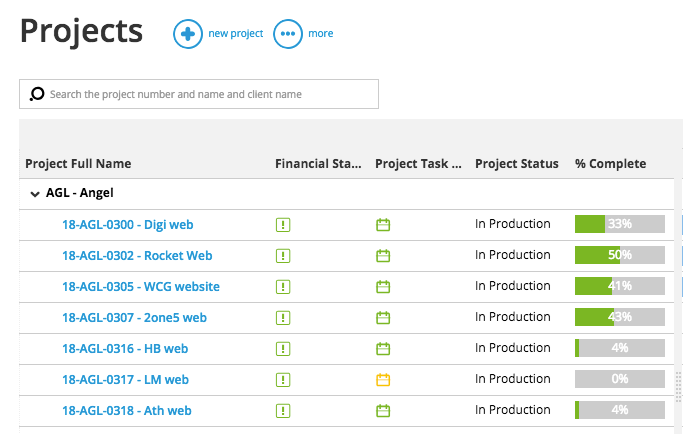 For example, Workamajig has health indicators that show you every deliverable’s completion status and financial impact. 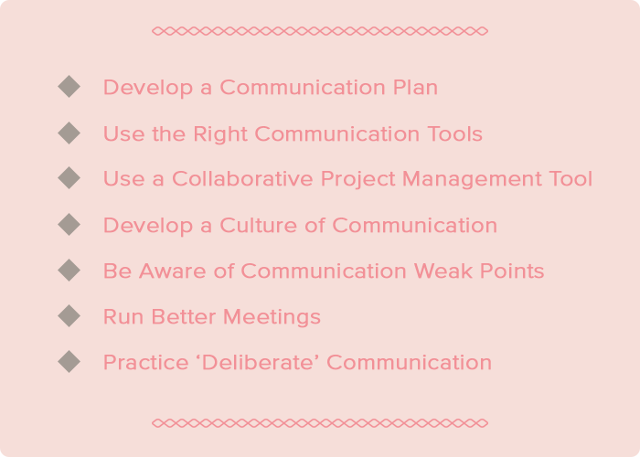 This can help you spot potential issues before they derail the project. As any experienced project manager will tell you, 80% of your time will be spent communicating with people. Whether it’s stakeholders, sponsors, or project teams, you’ll be jumping from email to email and chat to chat keeping tabs on things. Your goal is to make sure that everyone – stakeholders and project teams – know exactly what’s going on. No one should be in the dark about the status of a deliverable or a key requirement. The more you can keep people in the loop, the better you’ll be at your job. As a project manager, your ability to navigate these conflicts and negotiate solutions is vital. You’ll have to work across stakeholders to get them to agree on deadlines and deliverables. And when problems crop up, you’ll have to wade into the waters and draw up a resolution. Your negotiation skills are particularly important. This is a skill you’ll use every day – requesting additional resources, cajoling your team to work harder to meet a deadline, haggling with vendors to reduce prices, etc. A successful project team works like a well-oiled machine. They complement each others’ skills, anticipate needs, and keep each other accountable. Mastering project management can be incredibly challenging. 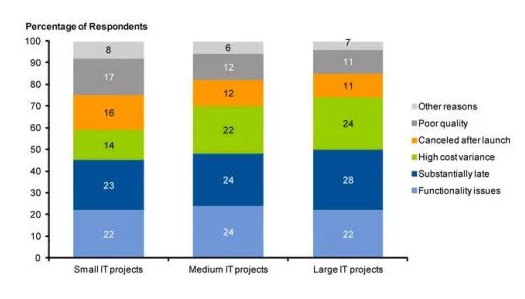 You have to develop so many project management skills simultaneously – domain expertise, leadership, planning, conflict resolution, people management.